During the US War in Vietnam and other countries in Southeast Asia in the 1960s and 70s, there was a massive movement by US soldiers to resist the brutal and illegal counter-insurgency campaign. Radical historian Howard Zinn documented well at the time in his book, Vietnam: The Logic of Withdrawal, that one of the main factors for the US military failure in Vietnam, was the level of opposition coming from within the US military. This opposition by US soldiers is visually depicted in the powerful documentary, Sir! No Sir! One of the major tools of US soldier opposition to the US war in Vietnam was the GI-led underground press. This interview, with Tom Henry, is an example of someone from the Grand Rapids area, who became involved in the anti-war GI Press in the late 1960s and early 1970s. The images used here are taken from copies of GI underground press that Tom was involved in. GRPHP – When were you in the military and where were you stationed? Tom – I joined the military (USAF) while still in high school in 1968. I was 18 years-old and terribly naive even though we watched the Viet Nam War on TV. I didn’t know much….but I knew that being 18 years-old in 1968 was dangerous and quite possibly fatal. I honestly had no idea what I wanted out of life at that age. I did know, however, that I didn’t want to die and that seemed more and more of a sure thing if you were drafted into the army. My older brother joined the Air Force after high school two years before me. He went to Germany and Northern Africa. Anywhere other than Viet Nam sounded good to me so, I joined up too. My first posting was to basic training at Lackland AFB in San Antonio, Texas (in late July, 1968). After eight weeks, I went to Keesler AFB in Biloxi, Missippi for training as an Air Traffic Controller. From there, I went to my permanent posting at Upper Heyford, Oxfordshire, England where I remained until my discharge in April, 1972. GRPHP – What was your involvement in the GI anti-war movement? Tom – My involvement in the GI anti-war movement was peripheral, at best. In 1971, a weekly newspaper started showing up on base that really struck a chord as it highlighted much of the stupidity of the American military and took a hard-line stance against the Viet Nam war. Some of us became involved enough to distribute petitions and to start organizing around a huge anti-war demonstration in London. GRPHP – What role did you play in the GI underground press? Tom – My role in the GI underground press was, pardon the expression, as a soldier, I guess. 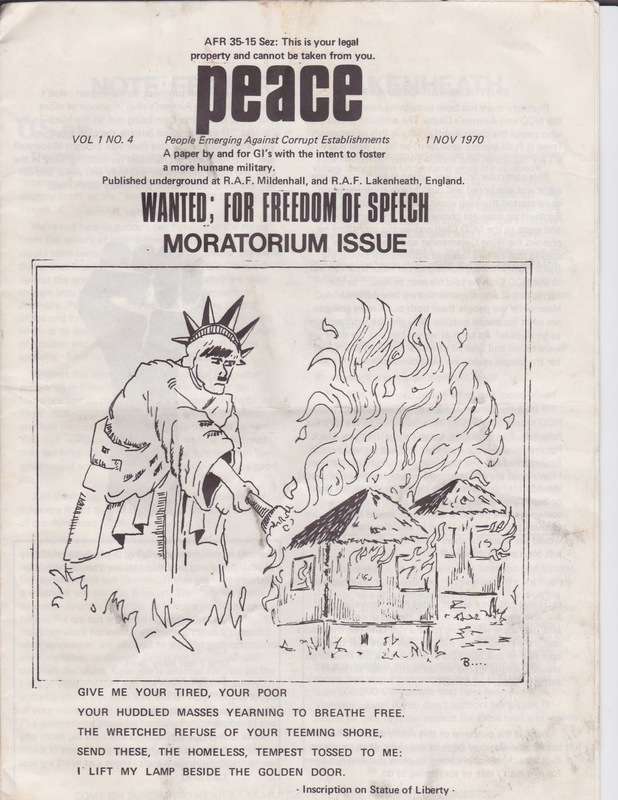 Although I never met the people in charge and there were no organized roles to speak of, I responded to articles in the press asking for volunteers to distribute printed materials, including petitions calling for an end to the war and I even submitted a couple of articles (none of which ever saw print). GRPHP – What kind of response did the GI press get from other soldiers? Tom – The GI press was very popular with the younger GI’s. The career guys were not amused and in the end, were either openly contemptuous or completely dismissed it as a joke. GRPHP – Were there any risks by being involved in the underground GI Press? Tom – At first, the risk was minimal. As the movement gained momentum, there were official responses from the military hierarchy including warnings to all enlisted personnel to avoid anything associated with the underground GI press. They were especially concerned about the planned anti-war demonstration in London and warned everyone that they would be prosecuted to the fullest extent of military law if they participated. GRPHP – Why was it important for you to resist the war in Vietnam? Tom – This is a difficult question to answer…..I guess the short answer is that I resisted the war in Viet Nam because it was so obviously wrong. I’ve lost track of when, exactly, I became a war resister. Certainly, what I was reading in the underground GI press and watching on the BBC was making me aware of things I hadn’t been aware of before but I think the fact that where I was and what I was doing was contributing materially to what I had come to believe was an illegal and immoral war was what finally did the trick. 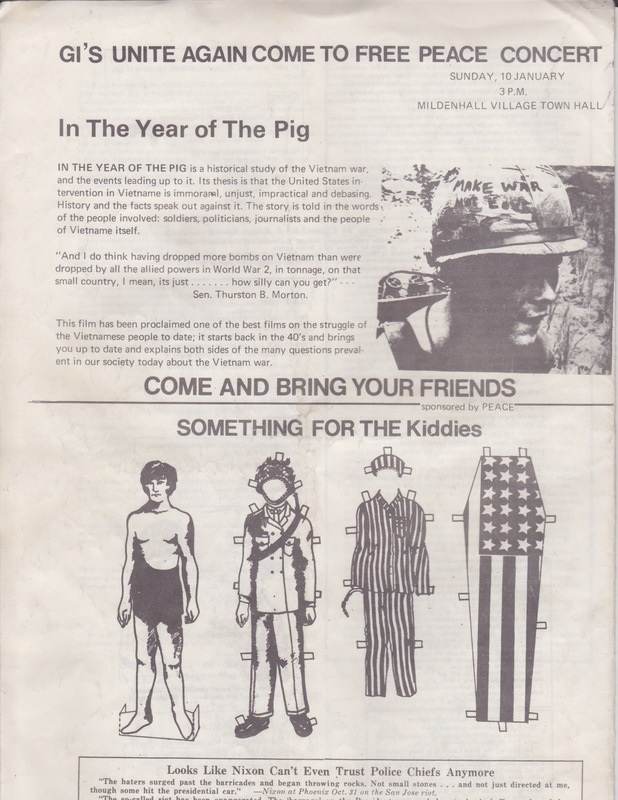 This entry was posted in Vietnam War Resistance and tagged anti-Vietnam war press, GI Press, underground GI Press, US soldiers against the war in Vietnam. Bookmark the permalink.